Beauty rules exist for a reason: like wear your concealer before foundation, always always take off all make-up before going to bed and make a smokey eye a little messy. But make-up isn’t fun until you take a few risks and break a few commandments. Take a cue from Sonam Kapoor who’s an ace at pushing boundaries (or completely ignoring them) and start your own rebellion. The rule: Don’t do bold eyes and bright lips. How she did it: This is a tricky prospect if you don’t know colours (green shadow will never go with red lips). Sonam strikes that balance with graphic eyeliner, gold shadow and a pop lip colour. #summertrends #makeup #love #pinkliner #instamakeup #skin #pinkgloss #instamakeup on the gorgeous @sonamkapoor here's a breakdown of how to recreate sonams look ❤️❤️❤️ beautiful pictures by @thehouseofpixels 1) Always start by prepping and refreshing the skin with a glow mist or avene face Mist ( it has essential oils ) 2) Apply An extra repair eye-cream only under the eyes, don't apply on the eyelids (it gets oily) . Use a primer (regular moisturiser that u use daily ) on the rest of your face and neck by gently pressing it into your face with your palms. 3) Use a corrector it brightens and covers discolouration under the eyes and neutralizes undereye darkness) followed by a concealer under the eyes and on any discolouration on the face(a yellow based concealer camouflages under eye darkness) 4) With a clean foundation brush apply a liquid foundation with medium to full coverage lightly all over the face and blend with a wet sponge. With a big powder puff use a loose powder to set the foundation into the skin 5) Use a pink lip liner as an eye liner , start near the tear duct and glide the pencil and finish off as a winged liner . Add a touch of yellow to the inner corner of the eyes. 6) Curl your lashes and apply 2 coats of mascara concentrating it towards the outer corner. 7) Use a pink blush on the cheeks and a soft pearl iridescent higlighter on the high cheek bones and bridge of the nose 8) Finish of this look with a pink gloss . The rule: Coloured eyeliners belong in the ’80s. How she did it: It’s all about using a complementary shade and exercising control. To get the look make-up artist Namrata Soni actually used a pink lip pencil along Sonam’s upper lashes and then finished it with just a hint of yellow shadow at the tear duct. Beautiful @lorealmakeup by @namratasoni ! Read the make up break down on my app, if you like the look!! How she did it: It worked because Sonam chose to complement a gleaming Rimzim Dadu sari with subtle, precise accents like a thin blue eyeliner and pastel nails. The rule: Dark lipstick is ageing. The rule: Never leave home with greasy hair. 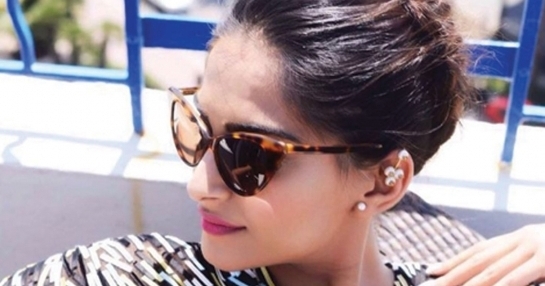 Which Sonam Kapoor look gets your vote? These rules exist for a reason: like wear your concealer before foundation, always always take off all make-up before going to bed. 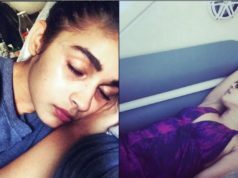 But not for Sonam!